The first plan the House of Representatives put forward to repeal the Affordable Cart Act (ACA) was the American Health Care Act (AHCA). The Congressional Budget Office projected that the AHCA would cost 24 million Americans their health insurance coverage by 2026. An amended version, which passed the House, cut this number to 23 million. Besides inflicting these coverage losses, the AHCA would have cost jobs and increased out-of-pocket costs faced by Americans. The second plan, the Better Care Reconciliation Act (BCRA) failed narrowly in the Senate. The CBO projected that the BCRA would have cost 22 million Americans their coverage by 2026. On one hand, it may have seemed like progress of some kind to reduce the number thrown off the insurance rolls relative to the AHCA, but the BCRA back-loaded severe cuts to Medicaid beyond the budget window that CBO traditionally examines. This means that in the longer run, the BCRA would have been even more destructive to health security than the House-passed plan. Additionally, unlike the AHCA, the BCRA cut not just the expansions to Medicaid passed under the ACA, but cut deeply into traditional, pre-ACA Medicaid, shifting the burden of paying for health care onto states and/or poor households. Think of the latest Republican entry, known as Graham-Cassidy, as the BCRA on steroids. After the CBO budget window passes, Graham-Cassidy is not a “repeal-and-replace the ACA” plan. It’s not even a straight “ACA repeal” plan. Instead, it’s a plan that repeals the ACA and cuts Medicaid over and on top of that. It’s, in short, an attempt to rollback not just the ACA, but even the coverage provided by the pre-ACA American health care system. 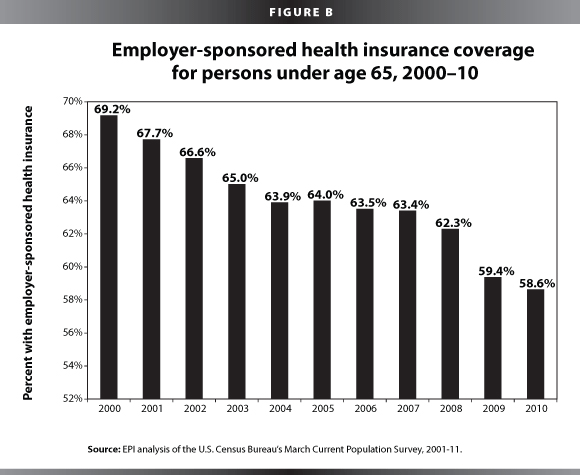 Just to remind everybody, this pre-ACA coverage system was unraveling at a rapid rate, with roughly 15 million workers losing employer-based coverage between 2000 and 2010. Previous CBO scores of the coverage losses of a straight ACA repeal are more than 30 million by the end of the budget window. And these straight repeals did not include the cuts to pre-ACA Medicaid spending trends that are embedded in Graham-Cassidy. An honest accounting of the effect Graham-Cassidy would take all of this into account. But the bill’s sponsors are clearly hoping to avoid this honest accounting—the back-loaded cuts are a clear attempt to juke the CBO score and hopefully hide just how many people it will deprive of health security in the long run. In the 10 years between passage and when the bill’s architects tried to hide the full impact of their bill, the changes made by Graham-Cassidy are grotesque. These changes annihilate protections for those with expensive pre-existing conditions. They destroy the individual marketplaces that provide subsidized, decent coverage for those working families whose employer doesn’t provide them insurance. Under the ACA, taxpayer dollars go to purchase health insurance coverage for families in the exchanges. Under Graham-Cassidy, these dollars can be repurposed for a number of things, including straight giveaways to insurance companies. Finally, the bill radically redistributes the rapidly shrinking Medicaid financing of the next decade, taking money away from blue states like California and New York—states that have actually taken up the ACA Medicaid expansion to cover millions of their citizens. Red states—including many that refused the ACA Medicaid expansions that would have covered millions of their citizens—would see large windfalls relative to these blue states, yet their overall level of Medicaid funding would eventually be savaged as they simply managed to grab a larger share of a swiftly shrinking pie. Basically, the Graham-Cassidy redistribution of Medicaid dollars is simple retribution against those states that collaborated with the hated Obama administration by taking the ACA’s offer of money to provide health insurance to their citizens. Further, particularly within the next ten years, Graham-Cassidy will drastically degrade the “automatic stabilizers” provided by public spending, which help us weather recessions. When a recession hits, state budgets come under immense strain. Revenues slow, as people pay less in income, sales, and property taxes. At the same time, spending increases as newly-jobless people qualify for safety net programs. In particular, spending on Medicaid increases. Currently, the federal government helps pick up part of this unexpected tab, paying for a portion of new Medicaid enrollees. If these enrollees are covered by the ACA Medicaid expansions, the federal government picks up most of this tab. This acts as an automatic stabilizer, injecting spending into the economy and keeping state governments from having to cut spending or raise taxes, which could further harm the economy. Research has shown clearly that Medicaid spending that comes online during recessions is extraordinarily effective in helping blunt the impact of these downturns. For example, estimates of the Medicaid spending increases by the American Recovery and Reinvestment Act during the Great Recession are that it saved over a million jobs. Graham-Cassidy turns the Medicaid expansion and exchange subsidies of the ACA into fixed block grants, which would cripple their ability to expand during recessions and provide macroeconomic shock absorbers. Under the ACA when people lose the employer-based coverage, they can count on the Medicaid expansion or individual market subsidies to help them retain health insurance, with minimal effect on states’ budgets. This is in turn would lead to an inflow of federal resources just as the economy needed it. But if Graham-Cassidy becomes law, block grant spending won’t budge during downturns. Further, Graham-Cassidy’s per capita cap on Medicaid spending means that over time, the recession-blunting ability of even pre-ACA Medicaid will also erode, as the inflow of Medicaid dollars into a state during a recession will steadily shrink over time. Graham-Cassidy is Trumpism in a nutshell. It is completely cynical. It is a raw negative-sum redistribution of resources to those currently in power. It lacks any policy depth at all—it simply repeals the ACA and slashes Medicaid. And, like the rest of Trumpism, its end result will be deep damage to America’s working families.